AMHERST, N.Y. – Daemen College has announced the public launch of the college’s first-ever comprehensive campaign, “Drive to 75,” which has already raised an incredible 75 percent of the goal. The ambitious $22 million campaign was officially kicked off on Sept. 8 at Daemen’s 70th Anniversary Gala held as part of the college’s inaugural Founders Celebration, a new annual tradition to commemorate the college’s rich history and origins. Daemen hopes to achieve the campaign goal by 2022 when the college marks its 75th anniversary. At the gala, Olson also announced that he and his wife, Dr. Lynn Worsham, have made a $1 million bequest to “Drive to 75,” making it the second gift of this size to support the campaign. This major milestone follows the college’s first-ever $1 million gift from the Paul A. Saffrin Foundation, which has been honored with the naming of the Paul A. Saffrin Center for Sustainability and Civic Engagement. Daemen’s “Drive to 75” campaign focuses on support for three key areas: endowed student scholarships and endowed professorships to provide funding in perpetuity for the brightest campus minds; enhanced program funding to elevate the academic success of students on Daemen’s campus and in international and co-curricular pursuits; and enhanced facilities to provide the highest quality academic, student life, and athletic spaces. The campaign is the largest comprehensive fundraising effort ever at Daemen, noted Craig Harris, vice president for institutional advancement. The campaign, which started its silent phase in 2014, is being co-chaired by Nancy Haberman Gacioch ’62 and Thomas M. Reynolds ’00. To learn more about Daemen’s “Drive to 75” campaign, visit daemen.edu/driveto75campaign. 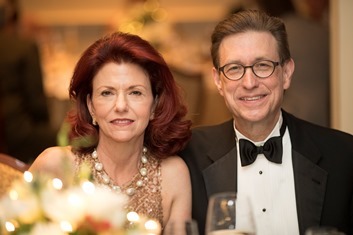 Pictured (on right) are campaign co-chairs Nancy Haberman Gacioch and Thomas M. Reynolds.